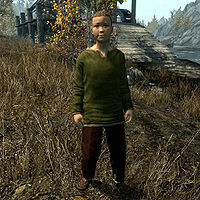 Gralnach is a Nord child that lives at Heartwood Mill with his mother Grosta. His father, Leifnarr, recently disappeared and Gralnach is understandably upset, although not as upset as his mother. He sleeps in the house every night between midnight and 6am and starts the day with a one-hour breakfast. While his mother works the mill alone, he spends the day fooling around the courtyard. At 1pm and 7pm he pauses for one-hour meals. He wears child's clothes with shoes. He carries a selection of food and toys and a small amount of gold. When you meet him, he will immediately mention his absent father: "It's just me and my mother at the mill here. My father is gone. We don't know what happened to him." After that, he will say: "I hope you're not here to start some trouble. I'll fight you if I have to. ", "My mother taught me the millwork trade... you know, which trees to cut and which ones to pass up. ", "Someday I'll take over the mill... when I'm old enough. ", "I'm not afraid of anyone. Put a sword in my hand and I could defend this place if I had to!" and "Millwork sure is boring, but at least I don't have to work in a nasty mine." If his mother dies, he will be sad and alone: "I can't believe my mother's gone. Now what'll I do?" After the quest Flight or Fight, he will be quite relieved: "I knew it! I knew my father was a hero and he didn't just run away." He does not go indoors at night with his mother, and will often be found standing around outside the house doing nothing. This bug is fixed by version 2.0.7 of the Unofficial Skyrim Patch. This page was last modified on 2 October 2014, at 13:04.